KHARTOUM: AGS Movers Sudan gave its full support for a fundraising event to assist female prisoners at Omdurman, Sudan’s largest prison. A project of the Ladies Help Ladies association, this special event aimed to improve the conditions of incarceration with a training centre to support women. The training centre will also support the incarcerated women’s children, ensuring they are adequately clothed, attend school and that their dignity is preserved. 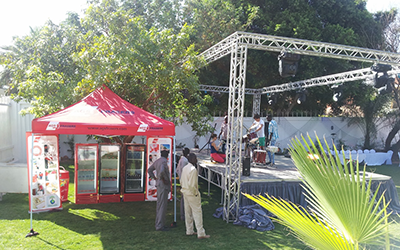 The charity event was held at the Khartoum German Embassy and enlivened by the all-female band, the Princess Cut. The AGS stand, located between the buffet and the stage, had the agreeable distinction of doubling as the VIP bar. AGS is an avid supporter of human rights and was pleased to have the opportunity to contribute to this event and support Ladies Help Ladies in Sudan.